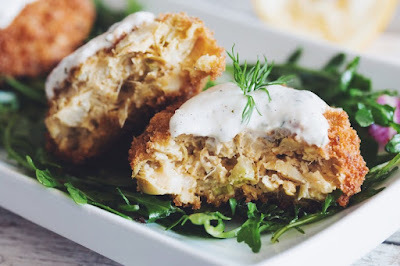 Vegan Artichoke Cakes with Horseradish Dill Tartar Sauce. Months ago one of my friends on Facebook shared a link to a video by Hot For Food - a Vegan food blog/vlog. I had two reactions. The first is that I truly don't like pretending that Vegetarian/Vegan food is anything but what it is. It's not chicken, beef or seafood. The second was that they looked amazing and I needed to try them. While I picked up most of the ingredients right away, I just didn't seem to get around to making them for quite a long time. Then two friends were coming for brunch this week. They were the perfect couple to try out this recipe on. Just to be safe, I made Roasted Vegetable Rice Bowls W/ Maple Balsamic Vinegar & Tamarind/Almond Sauce (recipe HERE) and served these on the side to add if they wanted. I shouldn't have worried. They were wonderful. As these were served on the side of a pretty flavourful dish, I didn't offer the side sauce. If I serve them as a main dish on their own in the future, I will probably offer two or three sauce choices. In the end I understood why they like to called them Vegan Crab Cakes. The texture and taste really were reminiscent of the original. But I still prefer to call them what they are - Artichoke Cakes. I apologize to Lauren and John from Hot For Food for the slight change, but have left everything else intact. My notes indicate the one change - I created gluten free bread crumbs as one of my guests had to avoid gluten. I have also included their image and their YouTube video for those who enjoy learning by watching. I'm going to have to explore more of their recipes to see what other hidden gems can be found. This was one was a winner. I encourage you to do the same - http://www.hotforfoodblog.com/. Up to 10 cakes depending on size. *Artichokes - I used 3 small jars (couldn't find the larger size jars shown in their video). When I put them in the measuring cup they were just under 2 cups. When I minced them, they measured only about 1-3/4 cups. They tasted great with the artichoke flavour subtle. Not sure if the recipe wants 2 C finely chopped or before chopping. If you want 2 cups it will take probably 4 small jars and I think more what the original recipe called for. **Bread Crumbs - I needed these to be Gluten Free as well, so whirled a few slices of fresh gluten free bread in my food processor. I like the lightness of fresh bread crumbs, so would probably do this to create regular bread crumbs as well. In a small mixing bowl stir together all the ingredients for the tartar sauce until well combined. Refrigerate until ready to serve the crab cakes. Drain the marinated artichokes, reserving 2 tablespoons of the liquid to use in the mix. Finely chop the artichoke hearts and add to a large mixing bowl with the remaining ingredients for the crab cakes. Combine well with a fork. Heat 1 ½ cups of vegetable oil in a large iron skillet to 350-375F. Set up a dredging station. Add chickpea flour to a wide shallow dish, use another shallow dish for the breadcrumbs, and a bowl for the almond milk. Take ¼ cup of the artichoke mixture and form a round thick patty with your hands. Place the crab cake in the chickpea flour and coat all sides evenly. Quickly submerge in almond milk and remove it from the liquid, then place in breadcrumbs. Using your hands cover the crab cake in breadcrumbs getting all sides well coated then lightly shake off excess. Batter 2-3 at a time right before frying. Delicately place 2-3 breaded crab cakes in hot oil at once, depending on the size of your pan. Fry for 3 to 4 minutes until golden brown, flipping half way through. Remove the cakes from the frying pan and place onto a plate covered with paper towel to absorb any excess oil. Serve immediately with horseradish dill tartar sauce. Leftovers can be heated over medium heat in a pan that’s lightly coated with vegetable oil.